Even to the most-learned men and women, few things are as scary, swamping and tearing as death. Like an end, that ultimate exit, beyond which everything becomes void and nothing remains to return, it hovers over us like a spying cloud, always waiting for that one chance to seize our life and make it its own. How then, would one, explain its inevitability, its invincibility, its essentiality to children? This gem of a book, majestically, rises to this task. At the strike of night, Death comes to take away a severely ailing grandmother. But her four grandchildren cannot let that happen. They keep Death busy throughout the night, with cups of coffee and innocent questions, delaying his action till the morning, when he would have to retreat because, after all, Death cannot function in daylight. But Death, the great equaliser, has to perform his task. And he does so, but not before explaining, in the most beautiful way, to the children, about the pairs the world is sewn into. Day and Night, Joy and Sorrow, Delight and Grief, Life and Death – The pairs have to be accepted together and without one, the other would hardly have any meaning. 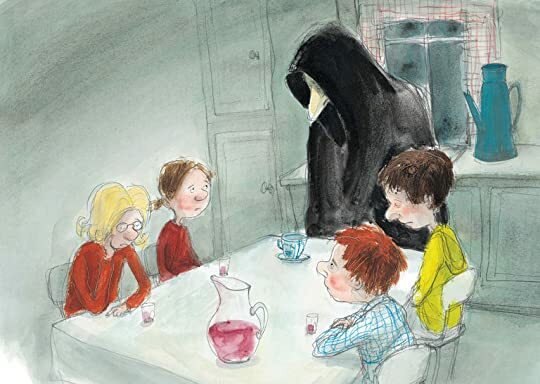 With some heart-warming illustrations, Ringtved paints a tender picture, wherein he not only emphasizes the values lying in the hearth of life and death but also imparts an immense amount of fortitude and resilience to the children, making them heroes of the story in their own rightful way. Should I not be afraid of, then, the ultimate terminator? Perhaps I should be still, but might take heart, in crying and not breaking.